THE IGLESIA NI CRISTO: What the Fallen Angels say is not what we see in the reality! THE Fallen Angels are still living in their “fantasy world” and they are getting worse: they are asking us to “explain” their “fantasy world”! They are asking us to explain the scenario happening only in their imagination! Please, stop hallucinating and open your eyes to reality! Indeed, what you are saying is not what is really happening in the reality. Truly, the Fallen Angels live in a fantasy world (a world exists only in their imagination) where as they imagined the CHURCH paying one million a day for interest, “baon sa utang” (bankrupt), that all locales and district have no “pondo” (fund), and because of these the maintenance and construction of the houses of worships are being neglected, the CHURCH is now in a financial doom, and that more and more brethren believe them. You want us to give an explanation of this “scenario”? Well, the truth is this “scenario” exists only in the Fallen Angels’ imagination. Err…imagination or hallucination? The multi-million pesos Houses of Worship constructed and being constructed ANSWERS all. However, Fallen Angels cannot see the facts because they live in a “fantasy world” and closed their eyes in the reality. Remember Binondo House of Worship? The total cost is 722 million pesos! Remember Christchurch House of Worship? The total cost is 4 million NZ Dollars! These were constructed in the year where you say that the CHURCH is already bankrupt! How about the more than 1,600 houses of worships constructed from 2011 to 2016? Note that the total cost is billions of pesos. Don’t forget the 148 ongoing projects of the CHURCH consisting houses of worships with more than 1000 seating-capacity like the one being constructed in Napindan, Taguig and Punturin, Valenzuela. Wait a minute! PUNTURIN??? Well, the Fallen Angels claim that this INC lot is in mortgage as collateral for the multi-billion bank loan (they even posted in the social media documents saying that this lot is “nakasanla”)? However, this lot is mortgage (as other INC properties Fallen Angels’ claim morthahe as collaterals) only in their “fantasy world” – only in their made-up scenario, only in their imagination. However, NOT IN THE REALITY. Well, it’s only a matter of time that this more than 1,000 seating-capacity House of Worship in Punturin, Valenzuela will be dedicated to God. More and more brethren believing them? They continuously asking the brethren to rally on their side, but how many showed up? Millions? Thousands? Hundreds? 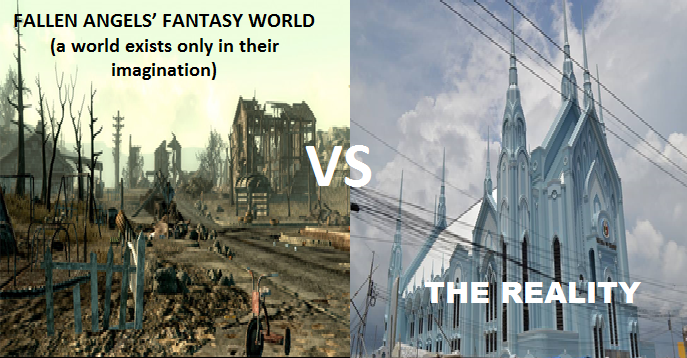 Only in your “fantasy world”! In reality, no one is believing you because everybody see what you say is not what is really happening. LOOK AT THE REALITY, FALLEN ANGELS! ALL THE ANSWERS ARE IN THE REALITY, NOT ON YOUR “FANTASY WORLD.” WHAT HAPPENING IN THE REALITY CONTRADICTS WHAT THE FALLEN ANGELS SAY! 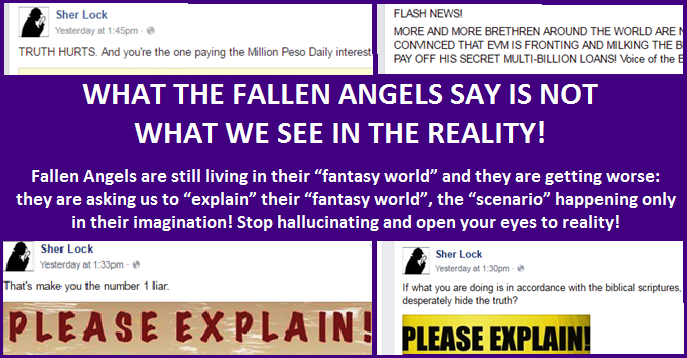 INDEED, THE FALLEN ANGELS CONTINUE LIVING IN THEIR FANTASY WORLD AND THEY ARE GETTING WORSE !